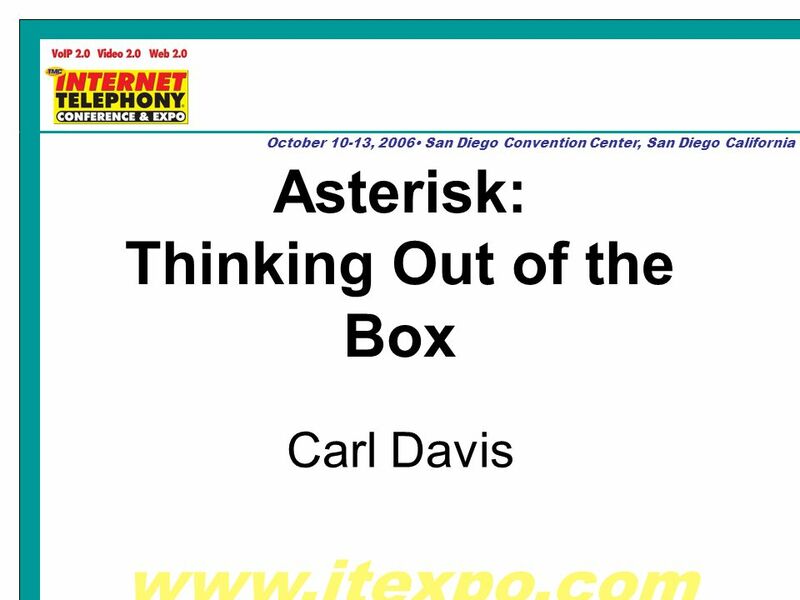 Www.itexpo.com October 10-13, 2006 San Diego Convention Center, San Diego California Asterisk: Thinking Out of the Box Carl Davis. 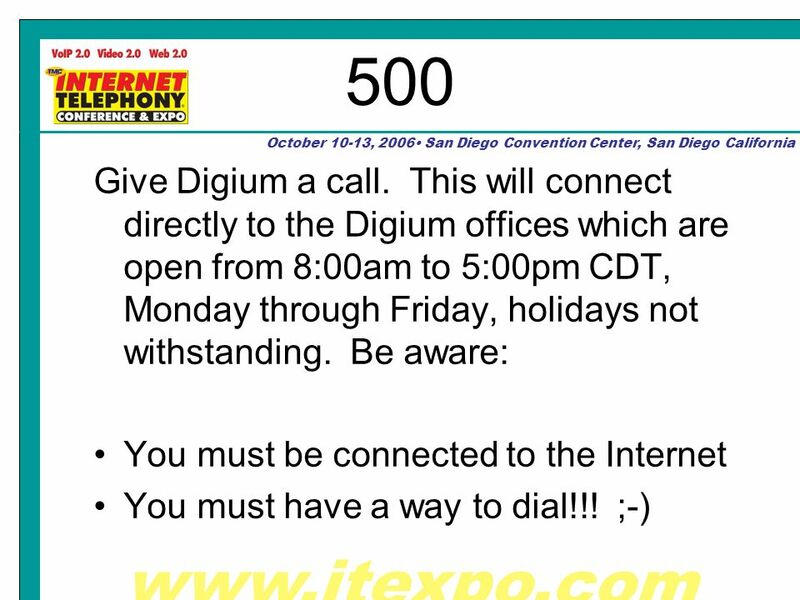 7 www.itexpo.com October 10-13, 2006 San Diego Convention Center, San Diego California How Do You Connect? 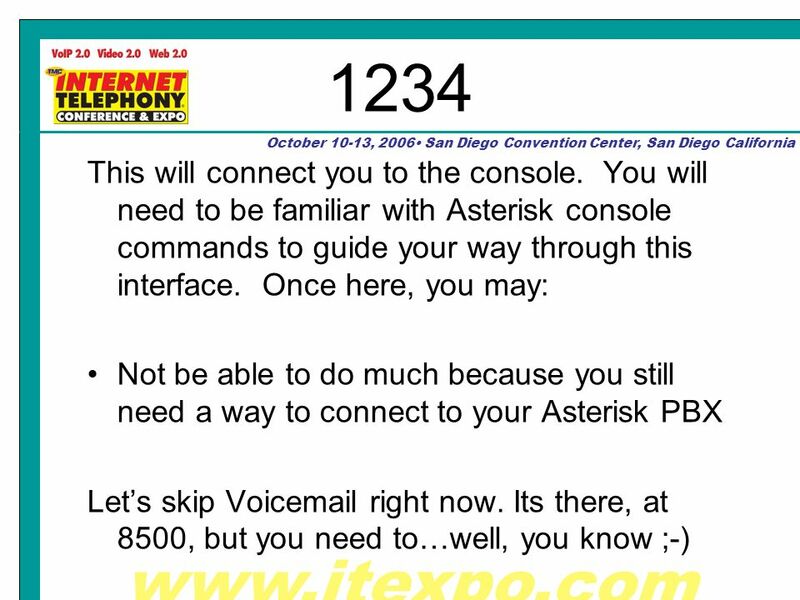 You, and the rest of your world, must be connected to this technological marvel you just built. 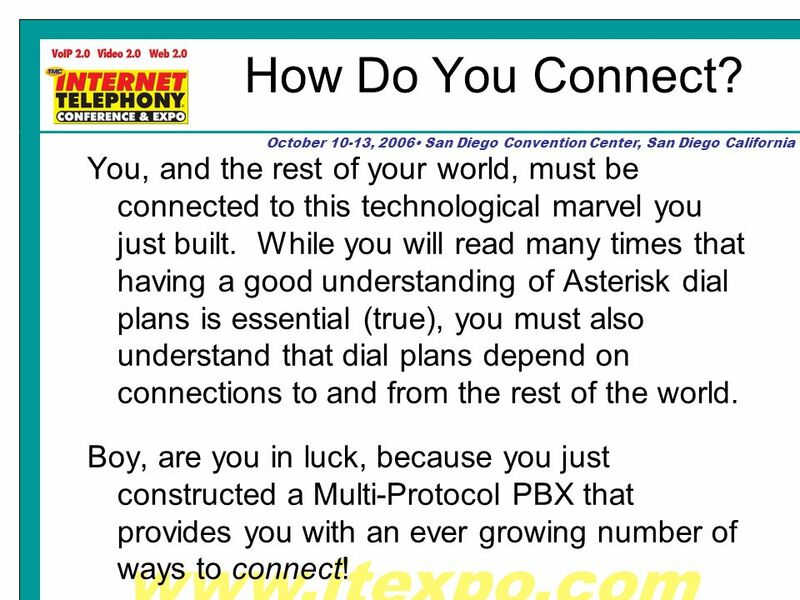 While you will read many times that having a good understanding of Asterisk dial plans is essential (true), you must also understand that dial plans depend on connections to and from the rest of the world. 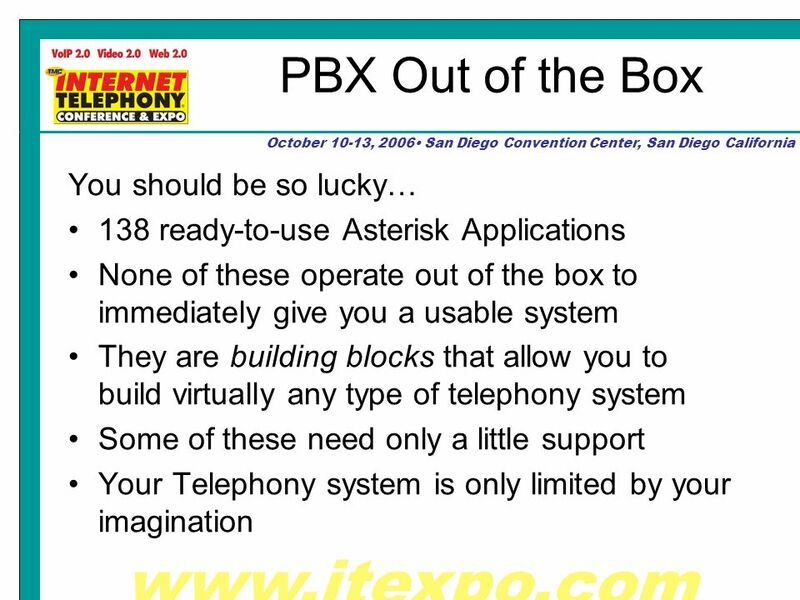 Boy, are you in luck, because you just constructed a Multi-Protocol PBX that provides you with an ever growing number of ways to connect! 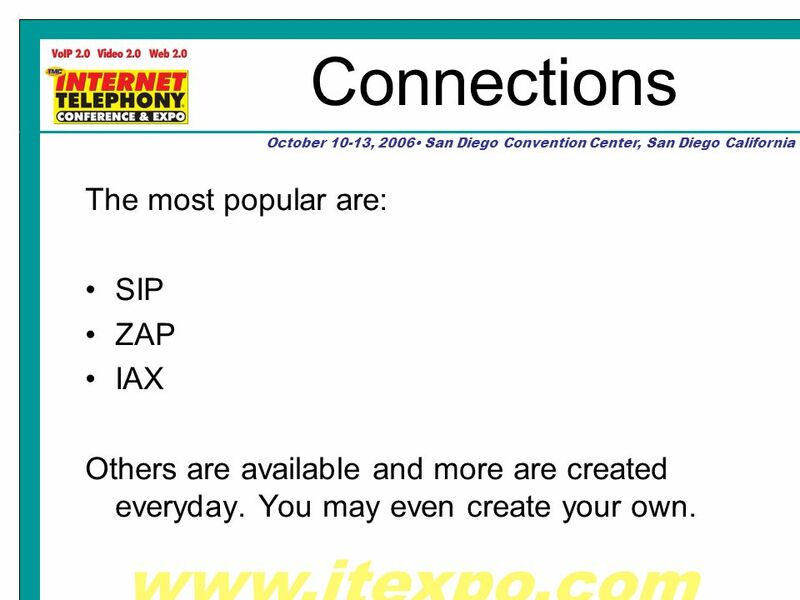 8 www.itexpo.com October 10-13, 2006 San Diego Convention Center, San Diego California Connections The most popular are: SIP ZAP IAX Others are available and more are created everyday. You may even create your own. 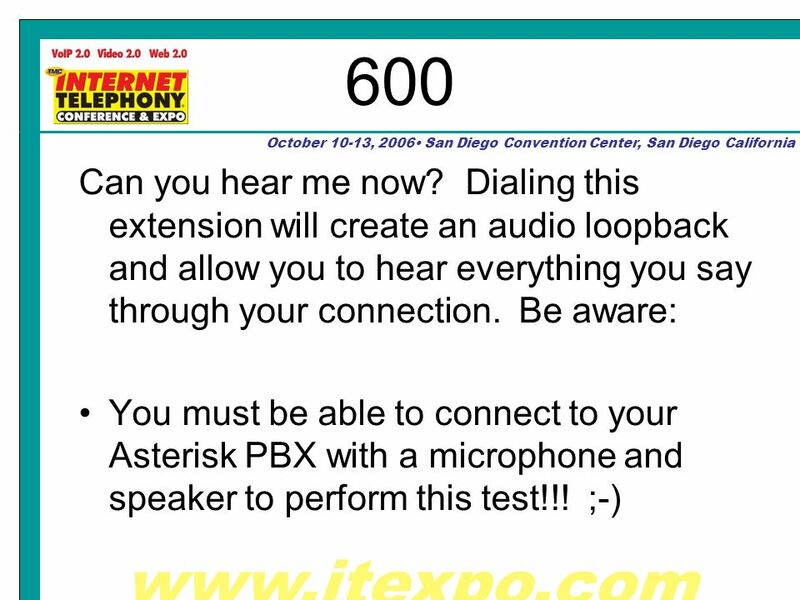 Download ppt "Www.itexpo.com October 10-13, 2006 San Diego Convention Center, San Diego California Asterisk: Thinking Out of the Box Carl Davis." Aspire Vertical Markets Law Office. Law Office Solutions. 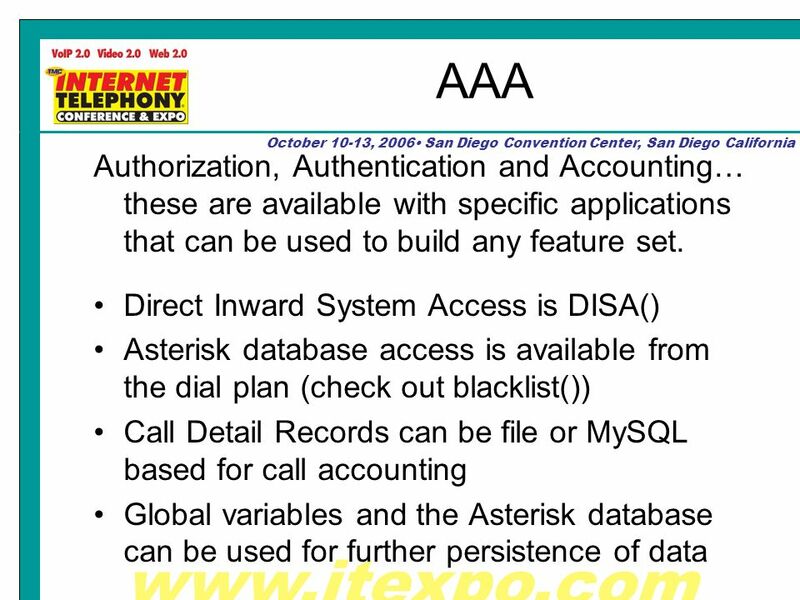 Aspire Vertical Markets Executive Suite Solution. 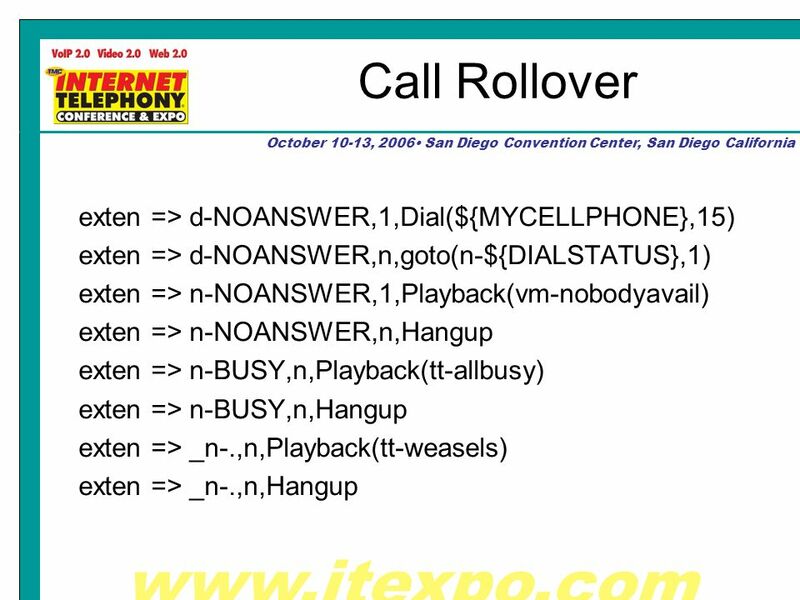 Asterisk in the Enterprise: A Case Study Dan Thomson – Executive VP VocalNet, Inc.
October 10-13, 2006 San Diego Convention Center, San Diego California Asterisk Jargon Carl Davis. 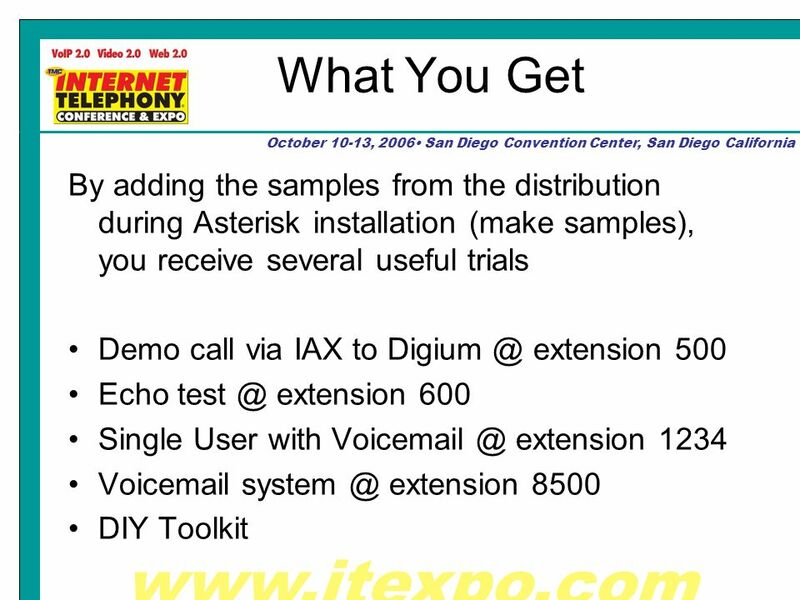 October 10-13, 2006 San Diego Convention Center, San Diego California Installing Asterisk Carl Davis. 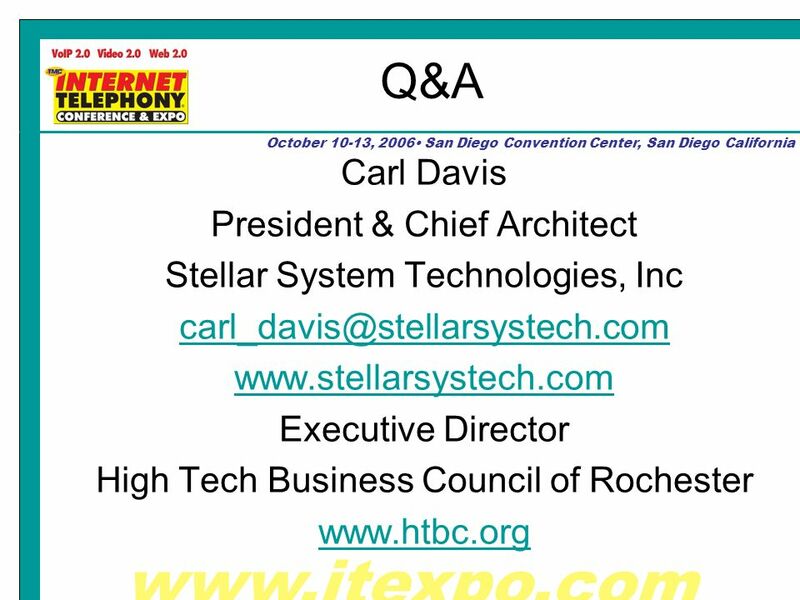 October 10-13, 2006 San Diego Convention Center, San Diego California The Business Case for Open Source/Asterisk Carl Davis. 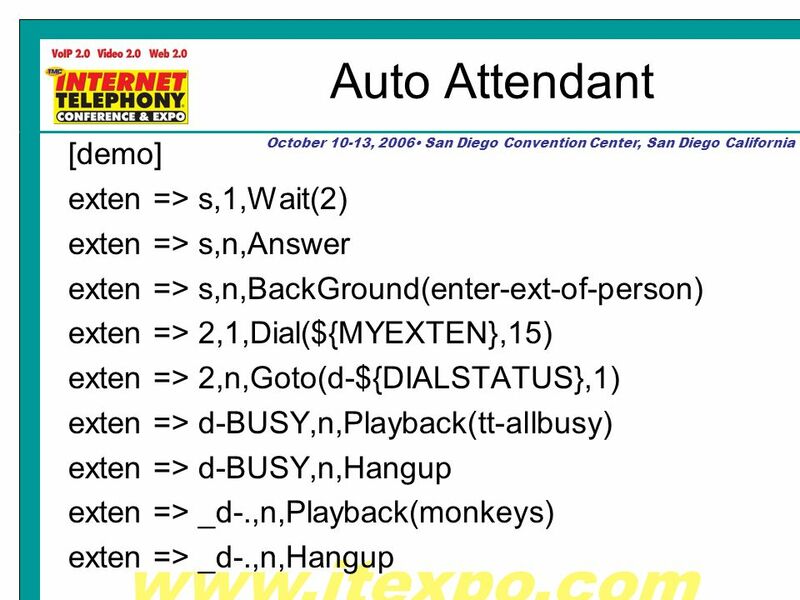 While you are waiting for this session to begin please make sure your audio is working. 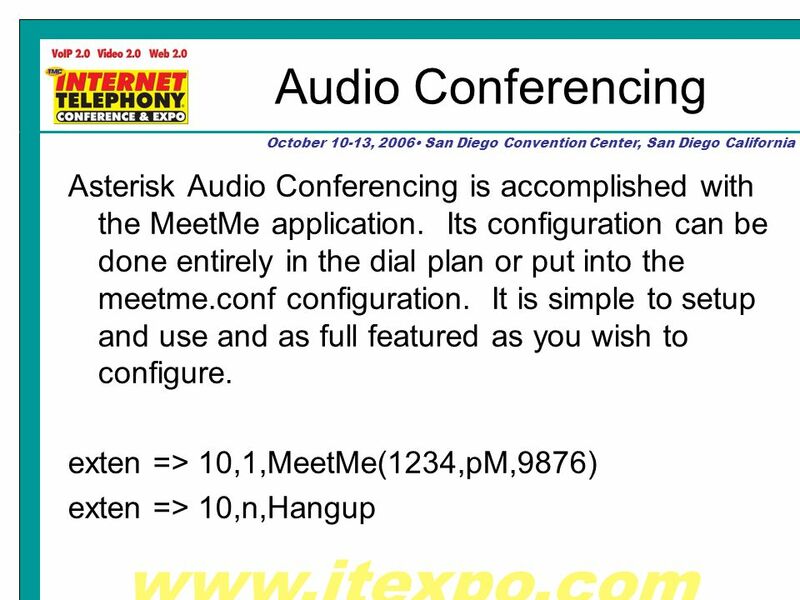 Go to the Tools menu, select Audio and then Audio setup wizard. 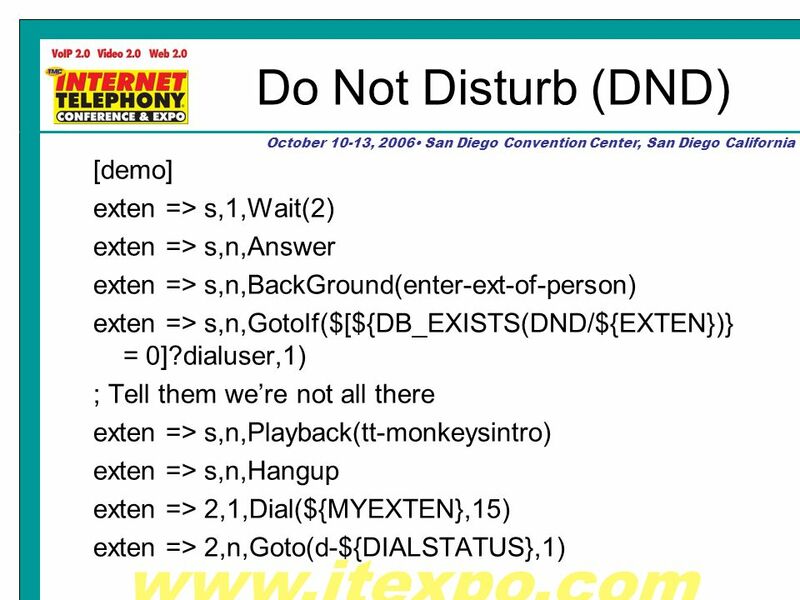 1 NatQuery 3/05 An End-User Perspective On Using NatQuery To Extract Data From ADABAS Presented by Treehouse Software, Inc. 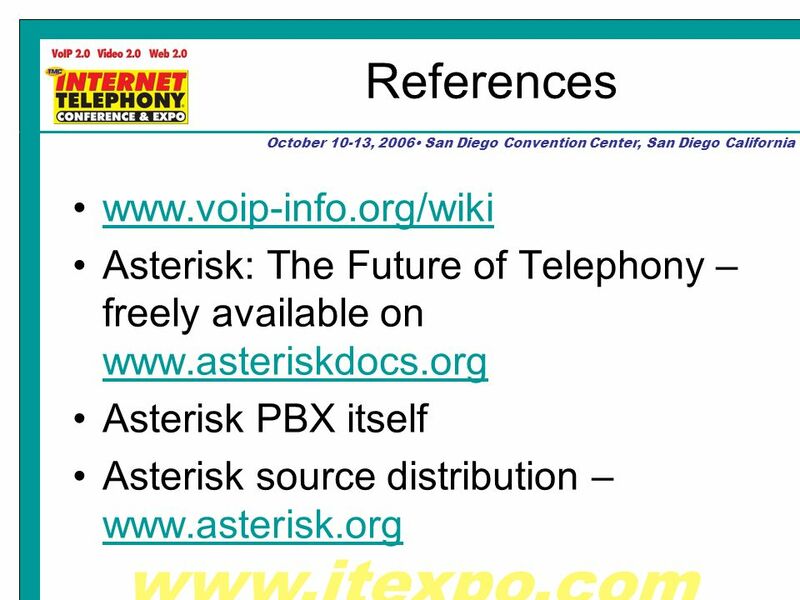 Virtual Office by Velocity Telephone, Inc. Trade Secret - Property of Velocity Telephone, Inc.
Trade Secret Information - Property of Velocity Telephone, Inc. The next generation of Communications on Campus The University of Toledo Unified Messaging. The next generation of voic on Main Campus The University of Toledo Unified Messaging. 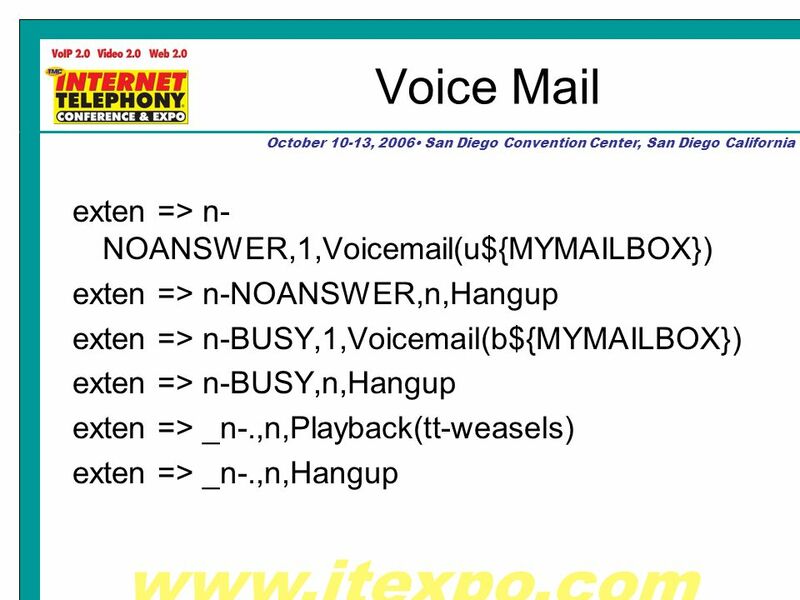 Voic Training for v Press any key to continue. Arcturus empower embedded. 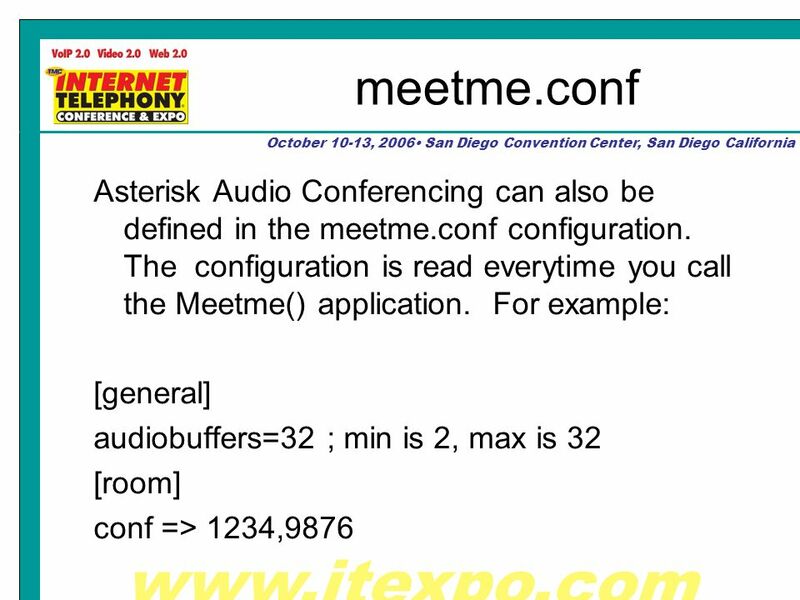 How To Setup Asterisk On the MCF54451 DRAFT – VERSION 0.5 January 6/08.